After what I wrote yesterday, I was worried I sounded smug or arrogant. I don’t want to talk about how amazing my life is…or at least not only how amazing my life is. Yet, even as I rejoice in the good things, I want to remember suffering through hard things, too. Yesterday morning, I took the picture above. This scene brought to mind a different season of life, one that I really did not enjoy. On August 17, 2000, Chrissy and I got on a plane in the morning in Chicago, made a connection in Houston, and arrived in Managua, Nicaragua, around 9 p.m.
One day can change a lot. We moved to El Porvenir, a village of forty families, on top of a mountain, at the end of a dead-end road. Our friends there grew delicious, organic coffee (buy it here), and lived off of the money from that. They (and we) ate mostly their own corn and beans. Our friends scraped by, living on dirt floors. As it turned out, we didn’t really help people there very much, or at least it didn’t feel like it. I got sick, and I stayed sick. You can read a lot more about our year in El Porvenir in Chrissy’s book, Into the Mud: Inspiration for Everyday Activists, True Stories of Africa. By the end of that year, I felt like this tree looks. 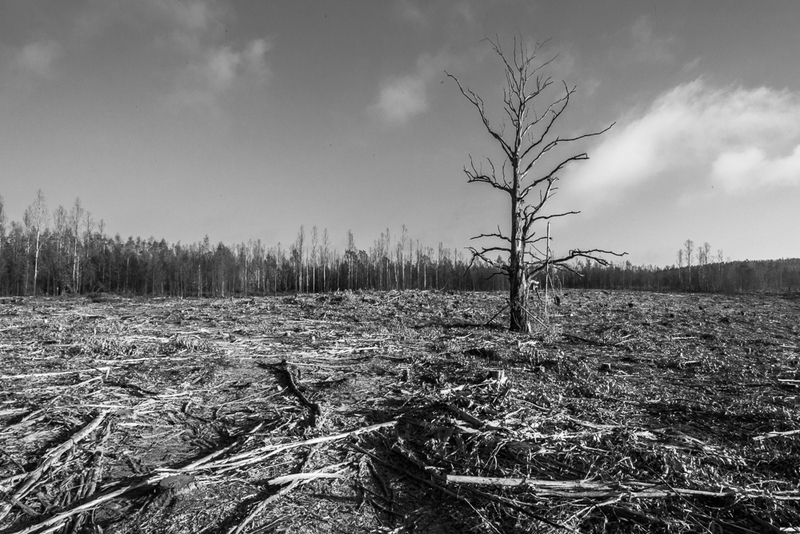 There was devastation all around, with stumps, bark, and limbs scattered across the scene. I was scarred. My expectations were missed by far. I was empty. The suffering nearly overwhelmed me. I felt fruitless, pointless. I was just barely standing. Suffering through that incredibly hard year set a bar for me, a standard that I needed. Things can be much, much worse. And so today, I give thanks. Today, I notice the beauty of the sun, the joy of a motorcycle ride, the satisfaction of meaningful work done well, this little house that meets our needs, the surprising laughter around the kitchen table, and connections with friends around the world, especially those in El Porvenir right now. I think back on my sickness, my weakness, my suffering, my listlessness in Nicaragua, and I am better able to see—and enjoy—the goodness around me right now. What good things in life are you seeing and enjoying today? Perspective often reminds me of a scalpel – it can do some serious damage, but its almost always of the necessary and helpful variety. That’s some wisdom right there, Eric. Great post – good message… Sometimes we need to slow down and look through another lens to realize how much we have in our lives.